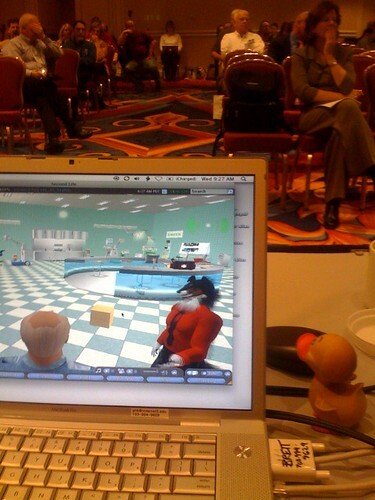 Snap of me as camera man during Virtual Worlds panel at Internet2 Spring Member Mtg. CD Barkley (aka Alan Levine) giving his presentation in character in world. George Brett, the photographer here, had invited me to be a panelist on a virtual worlds session at the Spring 2008 Internet2 Meeting in Arlington… and I participated remotely from home in Strawberry Arizona. George was the camera man and microphone for my “presence”. It was after I agreed to participate that he mentioned the session started at 8:45 AM. That’s fine, I told him, I wake up early. No, that is 8:45 AM on the Easr Coast, Gah! I had to wake at 5:00 AM to comb my fur. I was the goofy avatar among some big VWorld names like Michael Rowe from IBM and Mark McCahill from Croquet. I had but 10 minutes to blab about how NMC got into Second Life, what we’ve learned, some observations about people’s “attachment” to avatars, the notion that what happens in the space is more important than having a pretty space, blah blah blah. Michael Rowe spoke before me and did a good dismissal of Powerpoint, and then I came on w/o any slides or prepared notes. With this last round of conferences, I am so much more dog tired of people tying their sessions completely to slides, even when they are pretty slides. If I can read your words, bullets on screen, you are wasting my time by giving me information I can consume online. I am tired of monotone reading. Presentation is a good smidgen of performance, and man, have I been to some bad shows lately. I did about 4 sessions last week that were more conversational, and I am trying to avoid talking *to* the slides. I am invested in imagery, but am trying to get out of the bind my making them the drum I row the boat too. Your audience will appreciate and grok your message much more if you come across as a human, and if you dont read the damn slides to them. Anyhow, that was a rant off the track. Thanks again George for setting this up! I’m with you, Alan! Lately I’ve been trying to use slides only for graphics that supplement a presentation–no words allowed on the slides. If I have to put words on the slide, I need to rethink my presentation. At some point I realized that reading the words off of the slide was similar to “reading a paper” at a conference–a practice I have long despised. Except that with reading slides, it’s almost like you’re reading a paper that everyone has a copy of and can read along with you–arguably even more of a waste of time. Thanks Alan! You were the hit of the event. It really was great fun. What you might not know is that you were on one screen and the sldes (if any) were on another screen. So, when some of the people in the session joined us in the Research Area in SL they were seen wandering around. Also, text chats caught the eye of folks. So, there was a fun dynamic in the room building before you began your DogTation. It really was a big hit and demonstrated what can be done to link RL with SL in a meeting like ours. We really appreciate your sacrifice of sleep time. Now This is a Conference Bag!